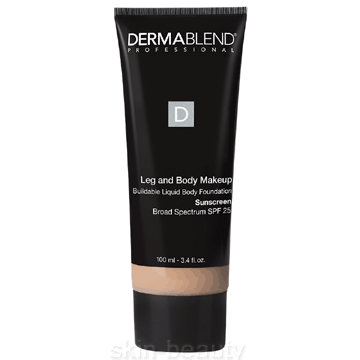 Dermablend Leg And Body Makeup SPF 25 is a buildable body makeup that can be used to cover a wide-range of body and skin concerns. This its lightweight, buildable and blendable body foundation formula hydrates skin all-day and protects skin with SPF 25. Containing high-performance pigments, Dermablend Leg And Body Makeup SPF 25 easily covers varicose veins, stretch marks, tattoos, scars, age spots, birthmarks and bruises. Buildable and lightweight with SPF 25. It can be used as tattoo cover up makeup. Enhances body features for a flawless natural look. Provides 16 hours of comfortable wear. Thank you for shopping at Skin-Beauty.com. We have been online since 1999 selling genuine brand name skin care and beauty products at affordable prices. We have a high loyalty return rate due to customer satisfaction, services, and great prices. Happy Shopping! "First time ordering from these guys and they did a great job. Ordering online was super easy and shipping to Canada was fast and rates were reasonable. Thanks"
"Eminence Clear Skin Probiotic Cleanser - I have been using the Eminence Probiotic line for about a year now. I love that it is made with all natural, organic ingredients. I had horrible blackheads and cystic acne. My skin has cleared up dramatically. I can almost go without foundation! It smells really refreshing also." Copyright © 2018 Skin Beauty. All Rights Reserved.